Dentures have long been used for the purpose of replacing missing teeth. They have a secondary role of providing support for the lips and cheeks that are near the missing teeth. 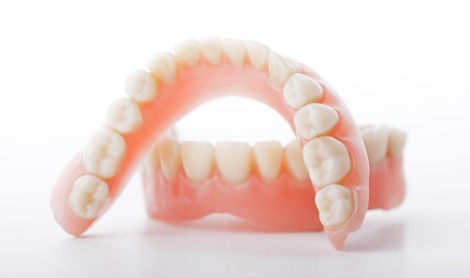 With the use of modern technology, dentures are now made that look very much like real teeth. Of course, the natural looking dentures mean that you can smile with confidence! When a patient still has one or more of his original teeth, he will only need partial dentures. In this case, the dentures will only replace the teeth that are missing. The replacement teeth will be attached to a plastic base which is designed to fit inside the mouth. Not only do dentures replace missing teeth, but they provide support to the remaining natural teeth in order to keep them from shifting out of place. If the partial denture replaces teeth in the upper jaw, the base is typically flesh colored and will cover the roof of the mouth. If the teeth to be replaced are in the lower jaw, the plastic base will be horseshoe-shaped in order to provide comfortable room for the tongue. 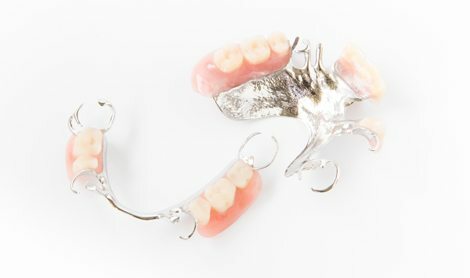 When a patient has lost all of his teeth to extraction or some type of accident, he will need a complete set of dentures. A set of complete dentures will be custom-fit and removable. This allows a patient to have a complete set of artificial teeth for eating, smiling, and talking. It will be necessary for the patient to have occasional appointments for any adjustments to the fit of the dentures. It is not uncommon for patients with a complete set of dentures to need a replacement about every 15 years to deal with wear and realignment. In addition, dentures are not able to protect the actual jawbone, so the bones will slowly dissolve anywhere that there are not still original teeth. This will gradually affect jaw alignment. This will also make it necessary for the patient to have occasional check ups to monitor the development of these issues.